This beach ranks #7 of the "Best beaches in Bora Bora"
Eden Beach Hotel Bora Bora is a 3-star hotel with a minimum room's fare US$300 per night. Of course this is expensive, but still much cheaper than in the neighboring five-star properties. In general, this is a good deal for budget travelers who can't spend even a couple of nights in an upscale resort. If you want to save a little money, buy in advance some food and drinks in the supermarket on the Big Island. But keep in mind that rooms don't have refrigerators. Fly to Tahiti international airport (PPT), and next fly to Bora Bora airport (BOB). Next take the hotel's boat. The boat coast for the one way is US$100, and it can take up to two passengers. 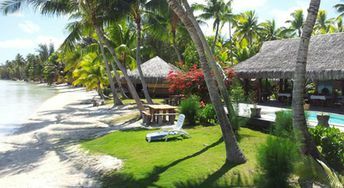 The best time for a holiday on the Eden Beach in Bora Bora atoll is a dry season from April to September.